WATERTOWN, S.D.—Before that fierce snowstorm rolled into South Dakota this week, Governor Kristi Noem visited Watertown. 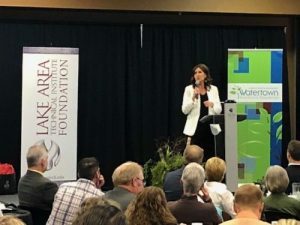 Speaking to a group at Lake Area Technical Insitute (LATI), the governor praised Watertown’s work on the initial flood fight that occurred in late March and early April…. The governor then shifted the conversation to workforce development in South Dakota, which Lake Area Tech can play a key role in…. The governor talked about her, “Week of Work” initiative, to get high school students thinking about employment and careers….. The governor spoke Tuesday at LATI’s 17th Annual Governor’s Luncheon.